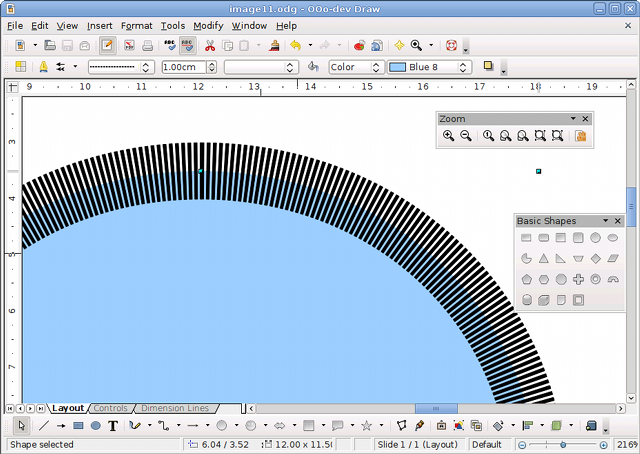 OpenOffice.org now uses a technique called anti-aliasing to improve the way it draws on screen (lines, circles, etc). You will notice an immediate improvement in the clarity of graphics - particularly charts - wherever they appear throughout OpenOffice.org. This also has improved 'graphic geometry' - e.g. when you overlay one shape on another to create a combined shape. See this article in GullFOSS for more details. 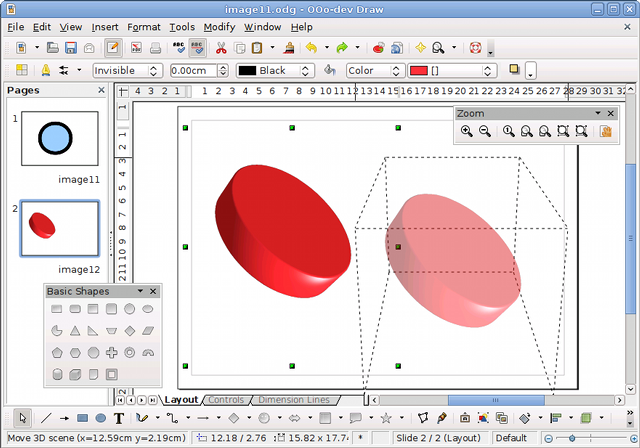 When you drag an object in a drawing across the screen, OpenOffice.org now shows you a 'shadow' of the object, rather than just a dotted outline. This makes it much easier to place images accurately in complicated drawings. If you are working on a network where several people may have access to the same document, file locking prevents people accidentally overwriting other people's changes. 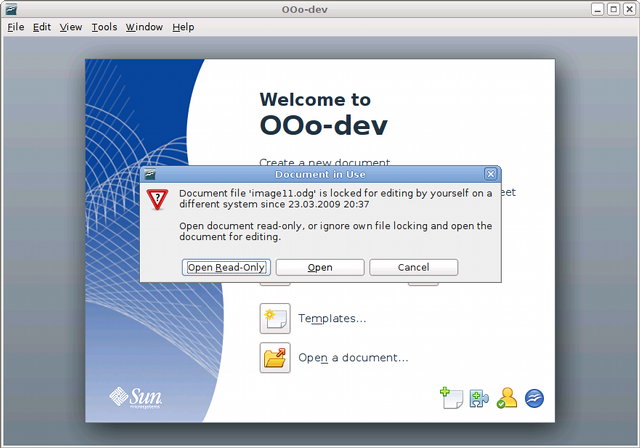 As OpenOffice.org works on different operating systems, it cannot rely on the operating system alone to tell users when a document is in use. 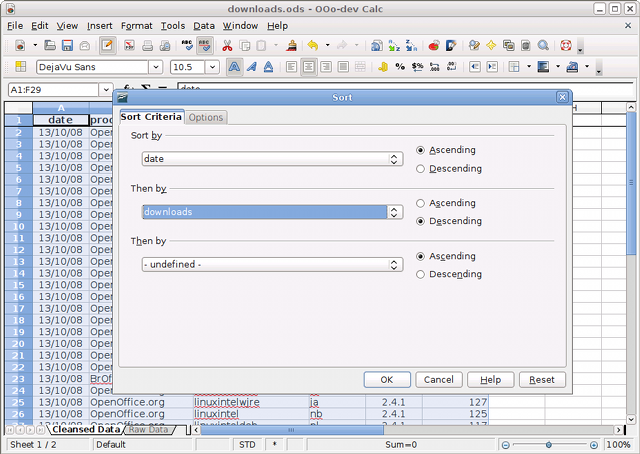 OpenOffice.org now has its own mechanism, which allows it to have a reliable locking when the locking from the operating systems fails. 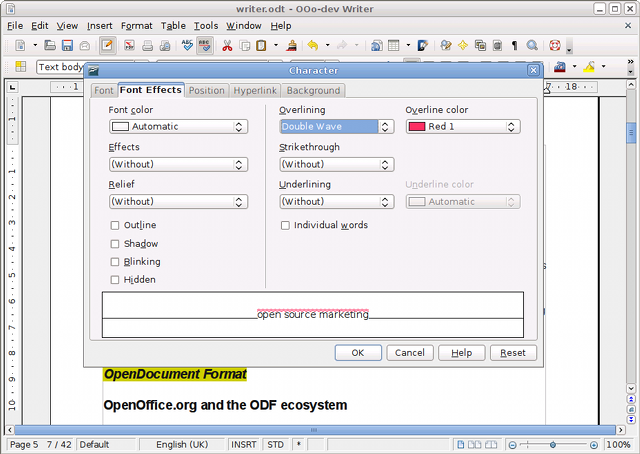 It also allows OpenOffice.org to see who has already opened the document. 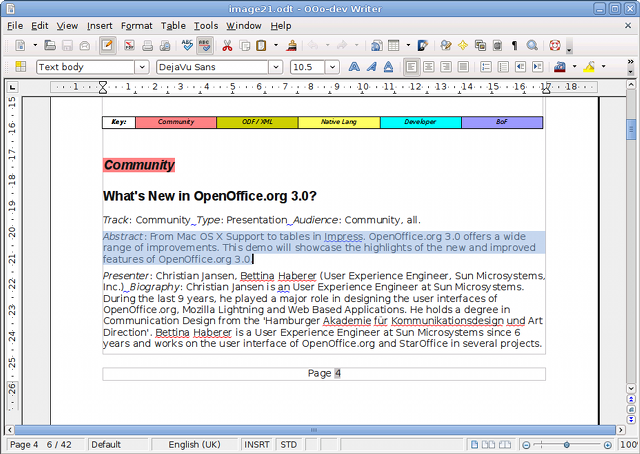 OpenOffice.org now supports overlining for text as well as underlining, with the same range of options as underlining (type of line, colour). Highlighted text is now displayed with a subtle background colour, rather than reverse video. Easier on the eye, easier to use. It's now possible for a series of editors to carry out a structured conversation through Comments, by right-clicking on a Comment and selecting 'Reply'. As a further enhancement, the Search facility now also searches the text of Comments. 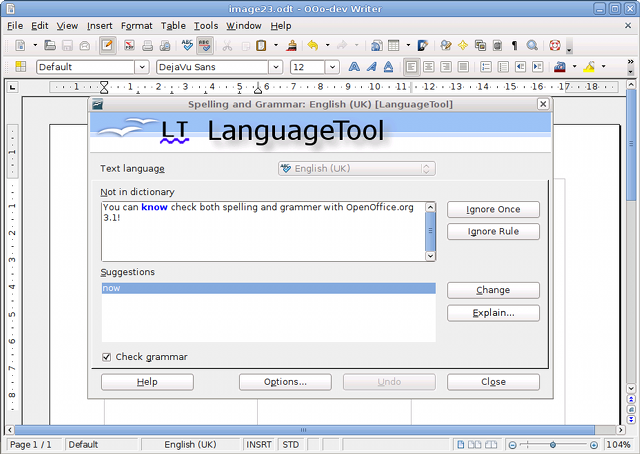 With OpenOffice.org 3.1, the grammar checker framework has been extended so that Extensions like LanguageTool can now be accessed from the Tools -> Spelling and Grammar menu command. 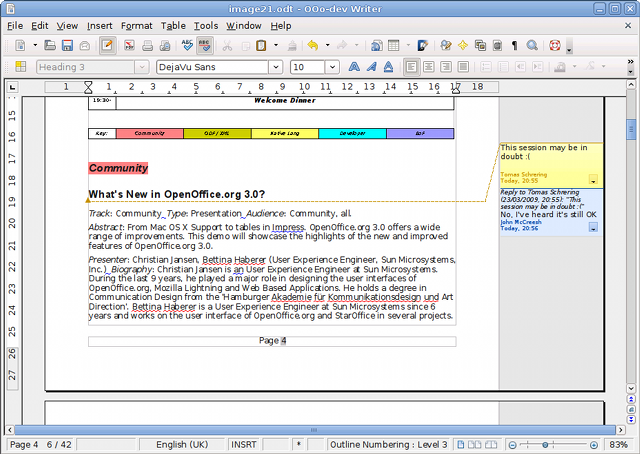 Note that OpenOffice.org has a grammar checking framework, but does not come with a grammar checker. This can be installed as an Extension. Writers of documents with complex ordering formats can now specify a new paragraph and paragraph style attribute "outline level". This transforms a normal paragraph into a heading, independent of any list style or paragraph style. Double-clicking on a tab in a Calc sheet now pops up the Rename dialog box. In previous versions, you had to right click on the tab and then select the Rename option from a pop-up box. This change makes it easier to carry out this frequently-used function. The new zoom slider control in the Status bar was a popular addition to Writer in OpenOffice.org 3.0. With 3.1, it's available in Calc too, giving quick and accurate control over the level of zoom of the display on the screen. Calc now keeps the syntax of a formula displayed right next to the cell as you type as a handy aide-memoire for how to use a formula. There are a number of changes to make sorting more logical, consistent, and powerful. The first time you use sort (or if you use the toolbar button to sort), Calc will assume you want to sort by the column where the cursor is located. The toolbar buttons now use the same logic as the sort dialog to determine if a range has column headers. Finally, when you sort, Calc now preserves the original order of entries with equal sort keys. 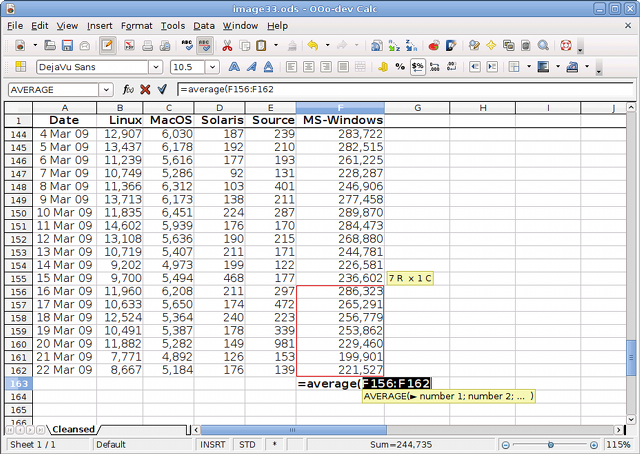 A new EUROCONVERT spreadsheet function to convert between former currencies of the Eurozone, including import from and export (binary) to MS-Excel file formats. New GAMMA, CHISQDIST, and CHISQINV spreadsheet functions, and changes to GAMMADIST, CHIDIST, and CHIINV spreadsheet functions for statistical analysis. The BETADIST spreadsheet function now has an additional optional 'cumulative' parameter to specify whether to calculate the probability density function or the cumulative distribution function, defaulting to TRUE for compatibility. Performance bottlenecks in Calc have been removed, resulting in dramatic performance improvements in the two test cases: from 24 seconds to 1.2 seconds in the first case; and from one hour to approx 12 minutes in the second case. This is part of a continous improvement activity to squeeze performance improvements from Calc. 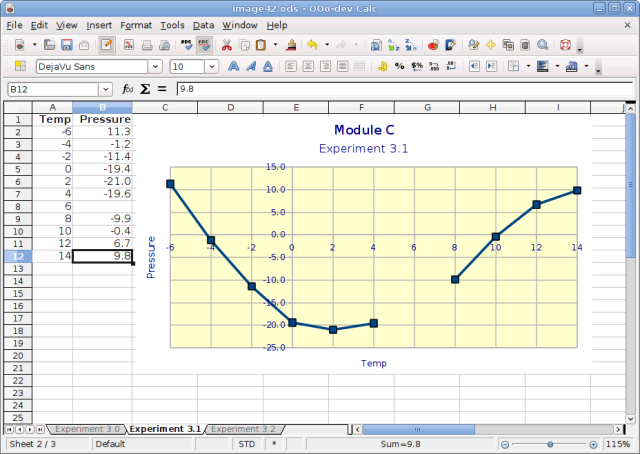 OpenOffice.org charts now offer a range of options for the placement of axes. This feature has been in great demand, particularly from educational users. 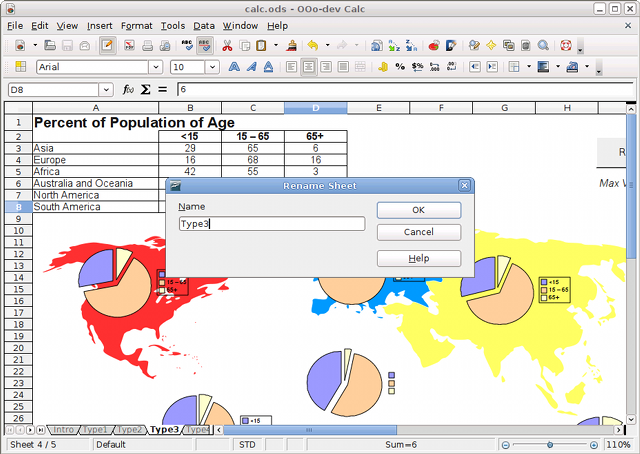 You may now also choose how OpenOffice.org charts handle missing data points - leave a gap, assume zero, or continue the line through the missing value. For further information on the changes to Chart, please see the GullFOSS post. Impress now has convenient toolbar buttons to increase or decrease the font size of text quickly and easily. Make your text fit perfectly in seconds! When you edit SQL, Base now uses colours to highlight SQL syntax. It will also 'flash' to indicate matching parentheses (). This makes it easier to spot spelling mistakes, errors in your SQL syntax, etc. You can create your own colour schemes using Tools -> Options -> OpenOffice.org -> Appearance -> SQL Syntax Highlighting, and choose your own font from Tools -> Options -> OpenOffice.org -> Fonts. 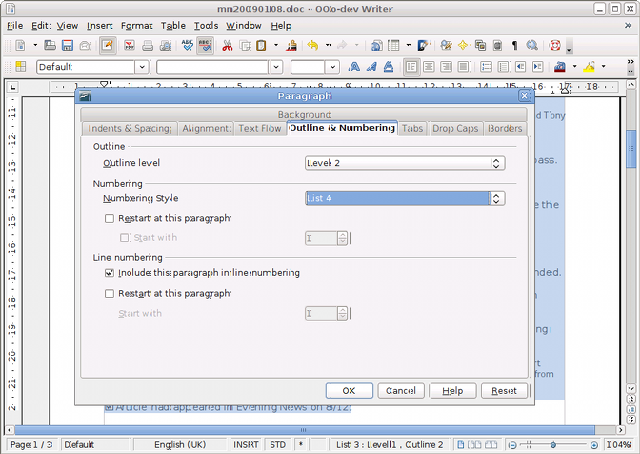 With OpenOffice.org 3.1, it is possible to build a complete 'database application' by including macros and scripts within a Base document (.odb). This feature already exists in other document types. This means macros can now be run from either the document itself, or any of its sub components: forms, reports, table design, query design, relation design, table data view. This is an important enhancement for people wishing to create complete 'packaged applications' in Base. Note: developers creating Base applications are advised to read the wiki article (see below) for important information about other developer features, and backwards compatibility issues. For further details on all the changes in Base, please see the wiki. Complex Text Layout and BiDirectional Text have improved considerably especially for justified text and for vocalized text. 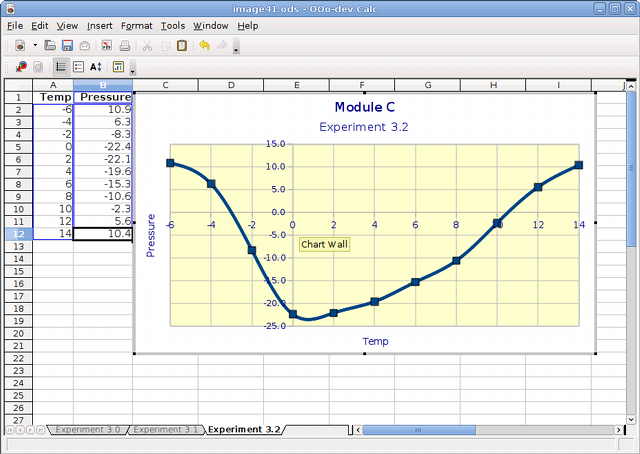 Control forms and Charts now support BiDi layouts. OpenOffice.org 3.1 adds locale data for Maltese (Malta) [mt-MT], Myanmar (Myanmar) [my-MM], Shuswap (Canada) [shs-CA], and Tok Pisin (Papua New Guinea) [tpi-PG]. The locale is selectable for character attribution and spell-checking, as default local, default document language and available for number formats and outline numbering. It also adds new Arabic locales to the language list box, selectable for character attribution and spell-checking: Arabic (Chad) [ar-TD]; Arabic (Comoros) [ar-KM]; Arabic (Djibouti) [ar-DJ]; Arabic (Eritrea) [ar-ER]; Arabic (Israel) [ar-IL]; Arabic (Mauritania) [ar-MR]; Arabic (Palestine) [ar-PS]; Arabic (Somalia) [ar-SO]; Arabic (Sudan) [ar-SD]. The language table and list box now also have an "Arabic" entry (without region/country) which doesn't correspond to a locale. It doesn't provide language attribution etc, but is selectable if an Arabic language pack is installed, instead of the previous "Arabic (Egypt)"